WebMerge is an online platform that allows you to easily collect data, populate a document and send it to any contact automatically. It provide you with flexible document types, dynamic content, and delivery options that fit to your business needs. Astrea IT Services is a Certified WebMerge Consultant. 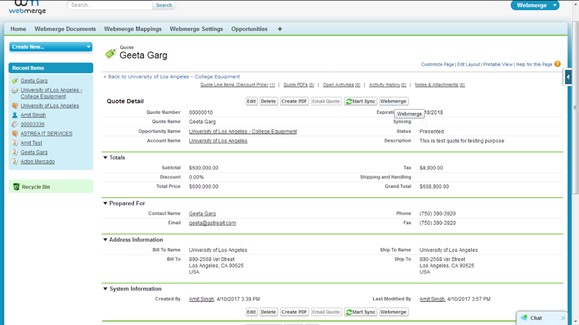 We have successfully integrated WebMerge with Salesforce and also implemented some custom business flows. WebMerge can be used for automating the documentation part like generating the invoice, sending it to the client, contract, agreement, application, hiring etc. Use of WebMerge minimizes the efforts for copying and pasting the contents in order to create the document. Before Webmerge Salesforce Integration you need to install the WebMerge app from Appexchange in your Salesforce Org and WebMerge can be installed using this link. WebMerge app is available on Appexchange. Before using webmerge app for document generation you need to authorize the webmerge account with Salesforce. Link the WebMerge account with Salesforce by using WebMerge API Key and Secret Key after clicking on "WebMerge Setting" Tab. Enter API key and API secret then click on login. You can find your API key and API secret from your webmerge account -> Profile -> API Access and then click on Generate new API Key. Before using document from Salesforce you need to create mapping for the object in which you wanted to use this functionality. 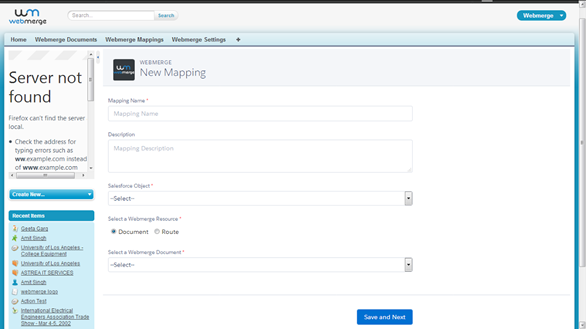 Configure the documents in WebMerge account and create the mapping according to the Salesforce instance. For this click on Webmerge Mapping tab and then click on create new mapping. Mapping for custom and standard objects can also be done. 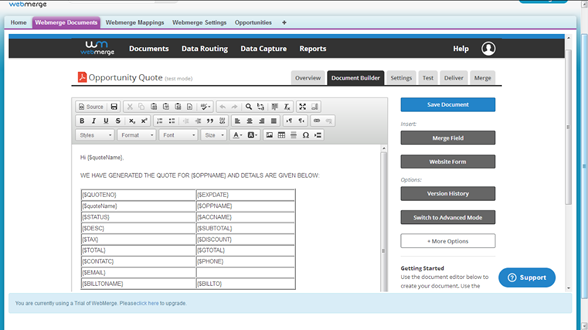 Add the WebMerge button in record detail page of the objects and then generate the documents using the mapping details which were created earlier. 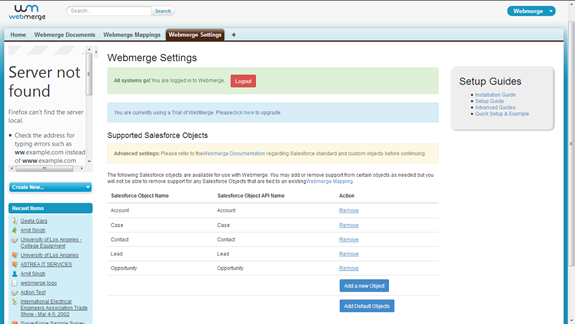 Webmerge provides the custom button for some standard salesforce object like Account, Contact, Lead and etc. if you want to implement for any other object you need to follow the steps given on the link. When user clicks on webmerge button it will automatically select the document from the mapping and will attach the same as attachment. Also, will send an email to the recipient. Document can also be generated without clicking the WebMerge button by using workflow functionality which has already been implemented in the App. Select the checkbox “Automatic document generation based on the defined rules" like creation of an record or any update in the record while creating the Mapping. Here webmerge uses Salesforce standard workflow evaluation criteria. Astrea is proud to be a certified WebMerge partner. Please Contact us for any requirements related to Webmerge Salesforce Integration..